Europe’s heart beats stronger and livelier than ever. To be or not to be… sunny… I am looking for the Sun’s funny smile through the leaden clouds carried by the God of Wind who feels at ease here. 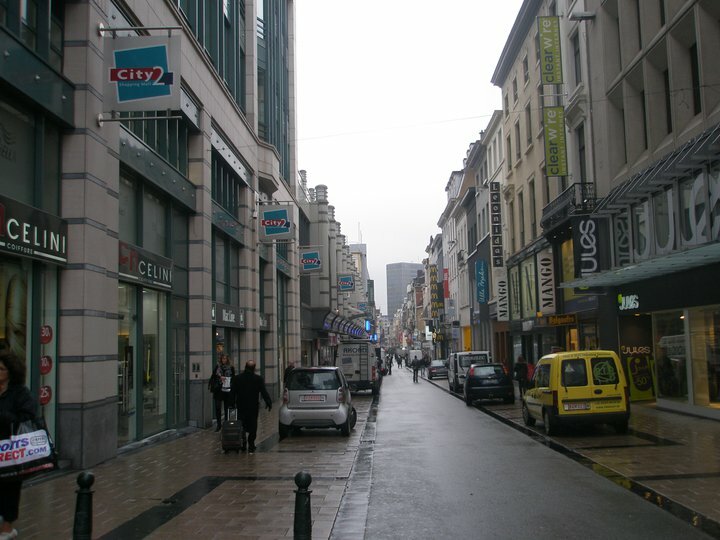 In spite of the grey weather, Brussels is a colorful city, a mix of cultures and civilizations: Europeans, Americans, Arabians, and Hebrews. It is an interesting city, not very large, but with many attractions. In my journey I will be calling at Manneken piss (what a naughty cheeky little man who makes a queue of tourists! ), the Grande Place, the EU Parliament, the Atomium and so on. You will see chocolate everywhere, beer, fries, lace and waffles. 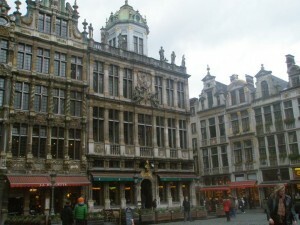 It’s a very cosmopolitan city, with golden roofs and typical green Belgian statues. I will offer a perspective of an amazing city that has now its own individuality, a symbol of United Europe. My first stop is the shopping center, City 2. The big mall, sheltering brands of all kinds, being similar to a swarm, on multiple levels among which me favourite is FNAC, the famous bookstore. After getting out, I continue on Rue Nueve, still among seducing stores like Mango, Mexx, Zara, H&M, C&A, all mermaids for shopaholics tempting them with their irresistible offers. I get to de Brouckere, the very heart of the city, where cafes and restaurants attract tourists to have a rest and enjoy world-wide cuisine. I get to the amazing Stock-Exchange building (Bourse) and my second stop is the naughty Manneken Pis (the little man pee known as Petit Julien in French). It is the landmark of Brussels and it gathers a lot of tourists eager to photograph it or to buy some of its replicas in chocolate or tiny bronze statues. There is a lot of folklore around it and the legend I like most says that a boy, Petit Julien, spied on foreign attackers planning to blow up the city walls and urinated on the lit wick, eventually saving the city. The original statue, made of stone was replaced with the bronze one, created by Jerome Duquesnoy at the beginning of the 17th century. 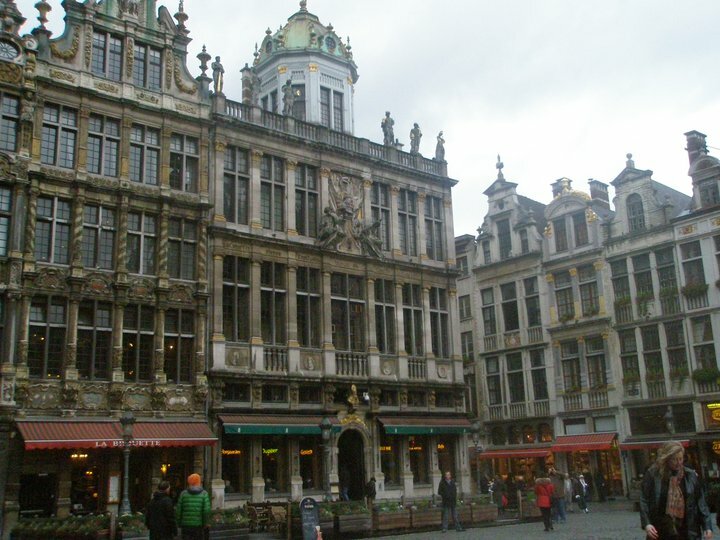 From there on, surrounded by chocolate, I get to my next stop, Grande Place, hosting the Town Hall, the Maison du Roi, a Brewers’ Museum and the Brussels Museum. I hear a lady telling to her child: “this is the most beautiful square in the world”. And I believe that it is at least one of the most beautiful, being labeled as a world UNESCO heritage site. The Gothic and Baroque meet in the buildings that have been built later on in the 17th century, and nowadays, in mid August one can admire a beautiful flowers carpet. I continue walking, and get to Gare Centrale and then to sacred destinations: three cathedrals built in the 13th century, in a Gothic style: Saint Michel and Gudula and Notre Dame de la Chapelle and Saint Niklaas Cathedral, sheltering a Rubens painting. No wonder that during the Middle Ages, Brussels was an important city, the headquarters of the most powerful tapestries guilds in Europe. This thought suddenly sent me back to Paris where the Lady and the Unicorn series, apparently sewed in Brussels, can be admired now. For the antiquities amateurs, Grand Sablon is a place where they can buy all sorts of furnitures, statues or enjoy a coffee. After a breathtaking view on Brussels, take your time to rest and visit the Notre Dame du Sablon Cathedral and the Petit Sablon, where you can admire interesting architectural elements. From the old times I move on to the contemporary era and notably the EU. My first stop is Place Lux (the famous Place Luxembourg) where many people gather during the evening to have a drink, and some month ago to watch the games of Football World Cup. The square I surrounded by the European Parliament building, all in glass and with famous bridges giving the EU institutions the aspect of a labyrinth. Then, one can see the buildings of the two consultative bodies of the EU: the Committee of the Regions and the Economic and Social Committee, on Rue Belliard (happy bells – literally meaning). The Commission lies further on with two impressive buildings, in a contemporary style: Charlemagne and Berlaymont (also known as the monster) close to the building of the Council and further on the Parc of Cinquantanaire. The last stop is as well related to the EU: the Atomium. Built for the World Fair of Brussels in 1958, known as Expo 58, and designed by André Waterkeyn it is a unique monument in the world, considered a Utopia. It is made out of 9 interconnected spheres and hosts both permanent and temporary exhibitions. It offers a beautiful panorama on Brussels, including a view on the Mini-Europe leisure park (//atomium.be/). To my mind it is a pure example of PR and branding for a place: the monument has no real function, as the Eiffel tour, apart from being a touristic attraction and identity building being considered the most Belgian monument. Its symbolism integrating all the elements of the personality of Brussels: the passion for the future, the happiness and young age of its inhabitants and eventually being the capital of the EU, a city where you can enjoy life!